As most people know, October is Breast Cancer Awareness Month, but it is also Adopt-a-Shelter-Dog Month. For those of you that have an adopted dog at home, you know that sometimes it's hard to determine who rescued who. Rescuing a pup is a rewarding and life changing experience. 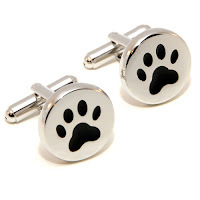 But since you can't rescue every deserving canine out there, you can get cufflinks that will donate to their cause. 25% of the sales proceeds from the sale of each pair of Paw Print Animal Kindness Cufflinks will be donated to the Best Friends Animal Society. Best Friend's No More Homeless Pets Campaign finds forever homes for pets who are considered "unadoptable", and reduces the number of unwanted pets through neuter and spay programs. Happy International Suit Up Day! Copyright © 2013 CuffSmart.com. Powered by Blogger.